Circuit training is a great way to get fit fast, and this routine is perfect for people who are short on time. All need is a few minutes and a pair of dumbbells. For this circuit, do each exercise intensely for 30 seconds before taking a very short break and diving into the next exercise on the list. The whole thing should take you just six minutes to complete, but fair warning: It won’t be an easy six minutes! A vital part of any circuit routine, burpees are an excellent full body exercise. Start by standing with your feet shoulder-width apart. Drop down into a squatting position and plant your hands on the ground while kicking your feet out behind you until you’re in pushup position. Bring your feet back up and return to the start position, then repeat as many times as possible for 30 seconds. Start with one knee and one arm on a bench, and hold a dumbbell in the other hand. Pull the dumbbell up to your chest level, then let it back down. Keep your back straight, and make sure not to use your leg to help you move the weight (if you do, that means you’re using too much weight. Do as many as you can for 30 seconds, then rest. Start with your feet shoulder width apart, then jump up, bringing your feet wide apart and your hands up into the air above your head. Jump back into the starting position and repeat for 30 seconds. A classic exercise, push-ups are one of the best full-body exercises you can do. Make sure to keep your back, neck and legs straight, and lower your chest almost to the floor. Maintain good form as you do as many repetitions as you can in 30 seconds. Stand with your feet a little wider than shoulder-width apart, then lower yourself down in a squat until your thighs are parallel with the floor. Make sure your knees don’t go past your feet. Stand in front of a chair or step and put your right foot firmly on the step, making sure your heel isn’t hanging off the edge. 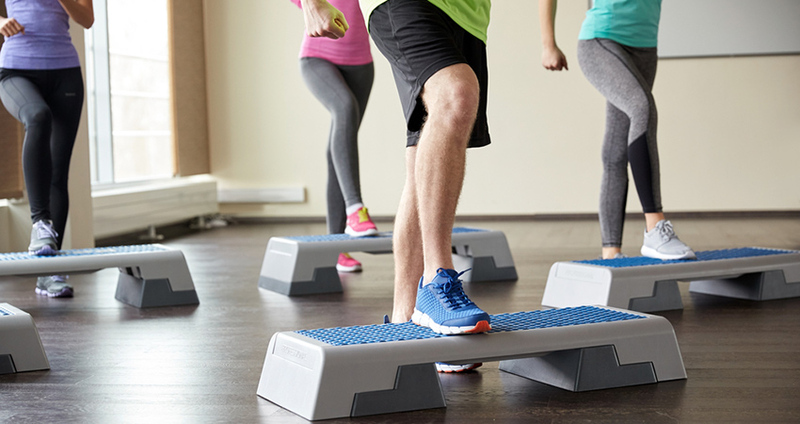 Push through your heel and lift yourself up until both feet are on the step, then step back down one foot at a time. Repeat with the other side, then continue alternating for 30 seconds. Begin by running in place and bringing your knees up as high as possible. Keep the intensity up and continue running in place for 30 seconds, then rest. Stand with your feet shoulder-width apart, then step forward into a lunge until your forward thigh is parallel with the floor. Keep your back and neck straight, and return to the starting position. Repeat on the other side, then continue alternating for 30 seconds. Get into pushup position, then lower yourself down onto your elbows, with your forearms flat on the ground. 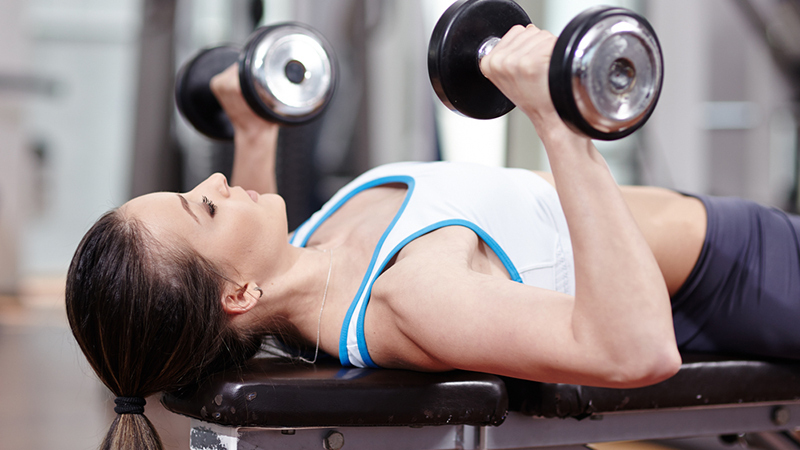 Perform a dumbbell chest press by lying back on a bench with a dumbbell in each hand. Hold the dumbbells by your chest and push straight up until your arms are extended. Lower the weights back down until your arms are at a 90-degree angle, then repeat as often as possible for 30 seconds. Remember to rest as little as possible between exercises without sacrificing form, and keep the intensity up. It’s only six minutes, so you should feel totally exhausted afterwards. If you’re feeling up for it, take a short rest and complete a second and third circuit for optimal results.